Gaze upon the most poorly conceived movie marketing campaign of all times. Some marketing blunders happen because of sheer carelessness on a typo-level, like the unfinished Matilda ad that went out last spring. 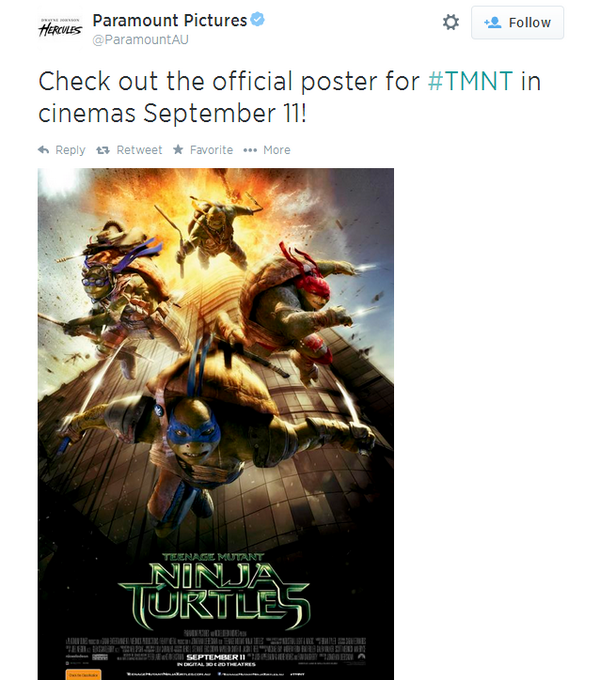 An Australian poster for the new Teenage Mutant Ninja Turtles movie, however, shows an insensitivity that’s almost beyond comprehension. The image of four figures falling out of an exploded skyscraper–even mutated, martial arts-trained figures–is at least somewhat problematic. Some people will never be able to see something like it and not be reminded of the terrible images of 9/11. Perhaps the target audience for the film is too young to know the events of that day in any way other than a historical sense, and so the allusion might naturally go over their heads. However, in Australia, the film will be released on September 11 this year (August 8th in the U.S.) and the coincidence really should’ve been caught by, I don’t know, anyone in the process from conception to poster to tweet about said poster. Whether the target audience notices or not, their parents will. Granted, not every area in the world has the top-of-mind awareness about 9/11 or raw nerves on the subject that America does, and perhaps rightly so. In fact, one could make an argument that the failure of this arch faux-pas to grab anyone’s attention at any stage until it was tweeted is a progressive sign of healing and the inexorable march of time. On the other hand, though: COME ON. Also, there had better be a scene in that movie where ninja turtles fall out of an exploding skyscraper. Because it already seems insane that this image is on a poster of the movie, but it would be maybe one degree less so if, um, it actually happens in the movie. Let us know if you think this is a big blunder or no big deal in the comments.